01 | November | 2015 | NOT IN MY WORLD!!!! Manatee, FL – Secretary of the Department of Children and Families Mike Carroll said “systemic issues” led to the death of Janiya Thomas and the department must learn from it. Janiya Thomas’ body was found stuffed in a freezer Oct. 18 after her mother, Keishanna Thomas, refused to discuss her whereabouts. The Department of Children and Families, the Manatee County Sheriff’s Office and the Safe Children Coalition all agreed to close the case on Keishanna Thomas after she became uncooperative with child protective workers in May 2014, according to a DCF report. At the time, Thomas had been accused of abusing her children 11 times and her oldest child, now 15, had been removed from her care when she was 4 years old with 22 body scars Thomas could not explain. The child, who said the scars had come from beatings, was eventually returned to Thomas. In May 2014, a complaint said the same child was coming to school with a strong body odor and the school had to provide her with deodorant. The report also said the girl had an infection since January and, in one incident, had slipped and hit her head at school. After officials made numerous attempts to contact Keishanna Thomas, she eventually told them to just put the child on the bus. The child was taken to the hospital and Thomas eventually picked her up. At that point, the investigator said Thomas was engaged with voluntary protective supervision, which is handled by the Safe Children Coalition, but had not been fully compliant. The investigator said there were “no implications for child safety,” and recommended VPS continue to monitor Thomas. On an unspecified date, the department, sheriff’s office and coalition all agreed to close the case because Thomas became uncooperative. On Oct. 16, the sheriff’s office came to her home to shelter children, ages 2, 9, 11, 12 and 15. 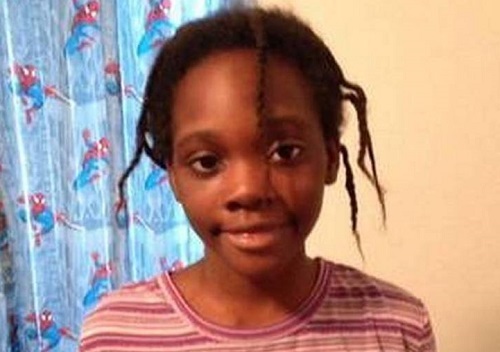 Two days later, 11-year-old Janiya Thomas was found dead in a freezer. She was last seen alive in June 2014, according to reports. Thomas is being held in the Manatee County jail on charges of aggravated child abuse, child abuse and abuse of a dead body. Maj. Connie Shingledecker, who heads the Child Protective Investigations Division in the Manatee County Sheriff’s Office, said she can’t talk about specific cases, but they have little option under the law to check on people and their children unless an investigation is open against them. And once the case is turned over to voluntary protective services, the Safe Children Coalition has discretion and is supposed to alert the sheriff’s office if evidence of abuse could call for removal of children, Shingledecker said. Such a call was never made in the case of Keishanna Thomas before it was closed. Officials with the Safe Children Coalition did not return requests for comment. Now, Gov. Rick Scott is proposing an additional $22.9 million to DCF’s budget to hire 272 more case managers statewide and reduce case loads. Scott’s office referred all comments about the announcement to a press release, declining to say whether the announcement was partially motivated by Janiya’s death or where the new case managers would be sent. Through the Safe Children Coalition, DCF has 46 case managers in Manatee County. The average case load for each manager is about 20 at a time, according to DCF. There are 33 case managers in Sarasota with a case load of 15 apiece. Shingledecker said they have had 3,228 hotline reports about child abuse so far in 2015, not counting out-of-state reports. To address those allegations, there are 38 investigators averaging at least 85 investigations by each employee in 2015. Additionally, the department has a 31.6 percent turnover rate in 2015, up from a 23 percent turnover rate in 2014, Shingledecker said, adding much of that can be attributed to not paying people appropriately. Inexperience is not unique to Manatee County, Carroll said. About 70 percent of case managers statewide have less than one year of experience because the turnover rate within the department is huge. And the number of children being served by DCF and its partners is up as much as 66 percent in certain areas of the state this year.